Physical Appearance: 6 feet 4 inches tall and skiny. Long dark brown hair, olive green eyes. Strong yet doesn't look so strung. Weapons: A elven bow of Lorien and arrows. Two swords with elven script on them, these swords were forged by Celebron himeself many a year ago. The swords have white handels and are very thin and narrow. Eru'ohena holds the swords in two sheaths on his back in a X shape. Dress: Elven shoes and typical travelling clothes, has a Lorien cloak. Skills: Bowmanship and Swordsmanship, basic elven healing and scouting. History: Eru'ohena son of Calimo and Serme was born in Lothlorien. A short while (in elven terms...) after he was born his mother Serme left Middle Earth, his father Calimo stayed in Middle Earth because of his fondness of it, Calimo loved travelling through all Middle Earth, he loved the mountains and the woods, the rivers and the seas he liked walking by stones and plants. Calimo was killed by a troll on one of his travells to the mountains. Appearance: Only 5 feet 3" and skinny. Dirty brown hair down to his shoulders, Olive Green eyes and tanned skin. Weapons: A short bladed sword he "found” once and a dagger. He also owns a flute which he considers as a weapon against fear and sadness. Personality: Armo is a very cheerful and happy lad. But he is somewhat suspicious about other people. He is also kind of a coward although he would never admit it. But when time comes he knows how to be brave especially if his friends are involved. History: About a year after Armo was born his mother left him, his older brother and his father. Armo doesn’t really blame her for leaving his father, he was a drunk and he would beat her up, he does blame her for not taking him and his brother with her. When he was 12 and his brother 15 they ran away. They were sick of getting beaten by their drunken father. They ran away and started wandering, that’s how he became a burglar. A short time after he turned 14 he and his brother came to a small village, they were going to steal some food from a house and as his brother went in he was caught by the villagers. Armo managed to get away and hide. He saw the villagers hang his brother for stealing. Since then he wanders alone, burglaring. Last edited by Eltirwen on Fri Feb 04, 2005 9:26 am, edited 2 times in total. Last edited by Orodben on Mon Feb 07, 2005 8:19 pm, edited 1 time in total. Clothing: Tae normally wears a silk lavender gown with velvet trim at the neck, sleeves, and bottom hem. A mithril and diamond belt is fastened loosely at her waist. Tae's neckline is modest enough to allow her to move and bend over without feeling exposed. The gown has cap sleeves in the summer and long sleeves in winter. Her hooded cloak is a greyish lavender that can and does serve as an excellent camouflage when needed. It is fastened with a brooch that matches her belt. Means of Travel: By foot or by horse, whichever is most convenient at the time. Personality: Tae is bubbly, friendly, and easy to talk to. She is very wise, but not so wise that she's above being goofy. History: Tae married a warrior elf named Belher during the First Age. Their life together was happy for many years. They spent a great deal of time in Lothlorien with Galadriel and Celeborn. Tae and Belher lived Lothlorien for most of the Second Age. While Tae served as one of Galadriel's weavers, Belher spent time training the border guards. Galadriel gave Tae the cloak, belt and brooch that she wears as a token of friendship and thanks. When the time came for the Last Alliance, Belher gladly went, under the command of Gilgalad. Sadly, Belher was slain by a mountain troll in battle. Tae mourned his loss for some time. Tae decided not to go to the Grey Havens after the Third Age ended. Rather, she choses to stay until she believes that she has done as much good as possible. She misses Belher, and knows that he awaits her in the Grey Havens. Tae knows that she has a purpose on this side of the sea, and she waits until she knows that her time has truly come. This is a work in progress. More coming! Age: Born sometime early in the third age. Hair: Black, thick and reedy. Parents: Her mother was Silverehair, sister to Goldberry. Her father was a strange, dark-haired man who spoke little of his past. Perhaps he was a descendant of Numenor. Birthplace: Tom’s house near the WithyWyndle. History: After her parents’ death, Sylv moved out of the Old Forest and dwelt by Lake Nierniel. Some years later, she took to wandering. She rarely crossed the paths of other races, following the lonelier wildlands through the North and far to the East. The fearful Dwarves of the Iron Mountains drove her and her companion, the WithyWyrm, south. Near the sea of Rhun they encountered an amassing army bound for Mordor, and in escaping were separated. They did not meet again until several years later, when they met by chance on the road near Bree. Skills: Sylv knows little of weapons, but she is quick and difficult to catch. She swims with the inborn skill of her race. Her voice is musical with a liquid beauty. She can, to a lesser extent, communicate with animals; was once acquainted with Radagast the Brown. Learned a limited and archaic form of Quenya from the Withywyrm. Apparel: Sylv wears an odd assortment of traveling wear. A long-sleeved shirt, a brown frock-like tunic so worn it is almost colorless, a dark woolen cloak and dark blue leggings above leather boots. She carries a leather satchel with a carven jade salamander, a glittering green dress that was a gift from her aunt, supplies, and a few odd coins. (Fortunately most bartenders do not look closely; the gold was forged far from Middle Earth.) On her person she carries little besides a small dagger and a golden ring, forged in intricate knotwork and set with a dragon-scale. The ring is not known to have active magical properties (as of yet...), though it is of ancient make. Last edited by RavenTinuviel on Wed Oct 25, 2006 6:40 pm, edited 1 time in total. Last edited by Sirion on Tue Sep 04, 2007 1:57 pm, edited 1 time in total. Last edited by Sirion on Mon Sep 03, 2007 5:37 pm, edited 2 times in total. Habitus: However at his thirties seems like man as at his fifties but somehow dateless.Red scar on his left forehead.Open air character but face little bit pale.When he smiles it is wide and supportive.Bit silent as all Rangers.Durable as long distance runner. Skills: Good woodcrafts skills:stealth,pathfinding,scouting,making fire etc.Skilled swordman.Dagger specialist with his daggerset.Also good horseman and marksman of bow.He left his bow and arrows to borderguards of Thranduil. Clothing: Brown weatherbeaten cloak with hood,under it grey chain mail not long,dark green trousers,long black boots.On his back he has waterback of brown leather and brown carrier back with needed things as ropes,flint and steel,small axe,reserve clothes etc.Special:on his back in the middle of neck and right shoulder he got daggerset.In his right long boot he has all round knife attached his leg. Bio:His father was one of the Dunedains captains and mother related to Gilraen,Aragorns mother.Already at his teens he followed his father to wilderness and as twenty-years old Thorgrond led small band of men to the raids and ambush to Trollshaws and Ettenmoors.There a huge black warg suprised and attacked him and caused multiple scars on his torso and that one on his forehead.After heavy duell he killed it with single blow of his sword.After recovering he continued raiding and patrolling both sides of northern Misty Mountains and crossing Anduin to the borders of Mirkwood. His mother dwelled sometimes at his teens in Imladris and he joined her time to time. Once again on his patrols near Mirkwood he was ordered as courier of Northen Dunedain and Elrond and Thranduil to make quick contact with possible outposts of Gondor in Ithilien and Cair Andros.It was March and he started his heavy journey by foot following east bank of Anduin.His intent was to get around Emyn Muil and follow its steep eastern slopes through Dagorlad and Dead Marshes.That part of journey was grave as air was thick and eastern winds carried heavy dark smog through Morannon.Once crossing a steep ridge he found three faint little footprints heading southeast.But he had to hurry.He crossed Nindalf and made it to banks of Anduin and then followed Anduin to southeast.He cast about three weeks with cautions in Ithilen until he desided follow the path made by heavy band of armed men just recently.It led him to the bank opposite of Cair Andros.He desided the cross the river at night and gathered drifted logs and made small raft.In the darkness with long staff he struggled against strong current and once drifting down the river he heard faintly somebodys struggling against undertow.He reached that poor fellow and pulled him on the raft.After recovering the gondorian accent revealed: "Be blessed stranger and let me thank you who ever you are....it was cold drink i might say..."
It was obvious that he was one of the raiders from Gondor and Thorgrond had made it last to friendly people and his trek was over. Thorgrond is found in A Soldier's Tale! Last edited by Wasara on Wed Nov 22, 2006 2:43 pm, edited 2 times in total. Last edited by Sirion on Tue Sep 04, 2007 1:58 pm, edited 1 time in total. Clothes: In his human form he wears black robes beneath a red cloak. This cloak seems to be able to hold an infinite amount of things from weapons to vials to books etc. Personality: Gloam is a being of evil or rather was. He still harbours the ancient evil inside but he has come to respect the light side so he has decided to take on a neutrality that only an immortal can. He loves a laugh and a joke. But you would be alot better off if you don't get on the wong side of him. Skills: He is experienced with all types of weapons and almost all magiks. Infact, he has created his own magical runic language that only he knows. He is also an excellent craftsman. He has created many inventions over the years and knows many crafts, from making weapons to making jewellery. Weapons: He has his sword named Akallabeth, a sickle, a whip, the staff of forms, a double bladed battle axe and a wrist crossbow. History: He was created with the elements that were there after Eru came into being and began his song. But he was sucked through a portal into a dark and evil dimension. He emerged from this place a year later as a totally different being. His essence had been forced into a physical form and he had been twisted into Evil. He wandered Middle Earth and set up a base deep inside Mount Gundabad (Deeper than the orcs or the Dwarves have ever been). Here he waited for many years, crafting his inventions and perfecting his shapeshifting abilities and his new magical language. He emerged every so often to take part in battles until after the fall of Sauron. At this time he set out and joined many of the new organsistaions that were promoting evil. Over the years that he has been wandering he has lost most of his evil nature and now respects the good and virtuous. Build: Small, shapely feminine frame that masked her true strength. Hair: Black with a dark brown tint when in direct sunlight. Eyes: Dark brown, near solid black and sometimes with a silvery gleam to them. Skin Varies from a pale tan to deep olive depending on the season and exposure to the sun. Occupation: Many. She knew herblore and was an enchantress of sorcery. She had worked in many lands in many trades over the many years... jewelsmith, exotic dancer, metalsmith, bar wench, gardener, prostitute, cook, needleworker, thief, hunter, inn proprieteress, concubine, and friend of animals. She was a survivor for she did what she had to do to get by. Skills: Small sword and dagger she knew how to use, but her blade of choice was a finger knife. Rarely she carried a weapon other than that, which she kept well hidden. She had learned unarmed combat and evasion as a child and furthered these skills when she lived for a time with a man, but when he was slain in battle, she learned no more but kept up with what she knew. She loved to hunt with a bow and was a fair shot with her bow of old. She could play a harp and had a few songs of her own, and had a small flute that she would play music for the birds to listen to. Lover or lore of all lands, Raven remembered knowledge especially if it interested her. Personality: She was her own person and was sometimes headstrong. She could be passive but it was usually because she wished or had need to be. Sometimes she was too trusting, and usually her judge of character was good, but a few times she had gotten int trouble. She was subtle and found no problem weaving a tale or do what she must to gain her own ends. Having once been in love with Amras, son of Feanor, they planned to be wed, but before the wedding she fell for his twin brother Amrod. Wishing not to cause Amras grief, she left their lands in the night and Raven loved not ever another of the Eldar. Bio: Raven was the elder child of Eöl and Aredhel, born premature and abandoned by Aredhel for she feared Eöl because she bore not a son. Aredhel told Eöl she miscarried and so the scrolls shown no record of her birth and her younger brother Maeglin was only child of Eöl, for she was forgotton. But Aredhel did for a time hold faint hope that her daughter may have lived, but she never would know for sure. Raven was discovered soon afterward by a scouting party of the men of Bëor when they first came into the lands of Beleriand. It was they who found her, and soon it was apparent that she was not dead. They gave her the name of Raven for her dark complexion and black crop of hair, and it was a flight of ravens hovering about where she lay in the grasses that led the men to her. She was cared for and nursed to health and soon gained strength. But she was always small, and her dark skin, hair, and eyes were always apparent to the men. As she grew, she had trouble getting along with all but a few of the other children. One incident that took place was some of the Edain children tried to drown her in a river because she was different, but she learned to swim and went across on them. She feared water from that day forward. Since she was shunned by her peers, she would watch and talk and ask questions of adults as much as they allowed her, and watched them in their trades. She especially enjoyed the visits of ones that were called Eldar, and the dwarves who they had befriended from the mountains. In this way she began learning skills at an early age, and it seemed she remembered it all. As she grew to womanhood, she went with her parents to a place where the dwarves come to trade with the Eldar, and the Edain would attend also. She was seen by one of Thingols tradesmen and he thought her to be Tinuviel. From that time she took that name as her last, for she knew now that she was Eldar, but she knew not her line and bent her thought to know of her birth parents. One day she bade farewell to the families who raised her and set out on her own, wandering from place to place. Through the years she gained ever more knowledge, both by teachers and by experience, and in her wanderings, she did what she had always had done in life from the beginning, survive. Make/model: Human male in his early 30s, originally of Dol Amroth. Weapons: A competent rider, archer and swordsman, prefers a cudgel-type-thing bound with spiked steel for close work. Also carries a hunting knife. Appearance: Massive and carefully unkempt, Dacil would look like a troll wannabe if not for his keen sea-grey eyes. 6'2", with bulky, deliberately cultivated muscles. Close-cropped dark hair. Heavy, cleanly shaved chin. Even though his clothes and equipment are new and well-made, they appear grungy and quickly acquire stains and scuff marks. Personality: Dacil goes to great lengths to appear nothing more than a muscle man for hire. He communicates pleasure by grunting and displeasure by flexing his biceps or smashing things with his fist. Very few manage or care to get close enough to discern a mind as quick as his reflexes. Still, he is a guy's guy and has respect of his fellow soldiers. Brief bio: An older son of a noble, the young Dacil became fascinated with prizefighting, spending much of his time on betting and competing. His father did not approve, and one thing led to another. The old man threatened to disown; the young man walked out. Some years later Dacil finally made his way back home. He found no welcome there. His younger brother, now the master of the estate, blamed Dacil for the deaths of their parents. Apparently, the word had reached the old man that his son was dead. Grief and guilt proved too much for him to bear. Dacil's mother, though much younger than her husband, survived him only by a few months. Again Dacil walked away from home. He made his living as a mercenary or bodyguard until he entered the service of the King of Dale. He served the Bardings as a Captain of Guards through the War of the Rings. When the Shadow departed and Mirkwood was tamed, Dacil took his leave and set out in search of new adventures. This is my gal's bio so far, but it will evolve as time goes by. 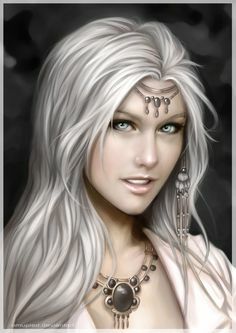 Nickname: Fordorthien “female dweller of the North” (given to her by a man from Harlond that she once had strong feelings for), brithla tithen “little pearl” (something her father used to call her). Race: Elf, part Falathrim, part Noldo. Age: Not entirely certain, but about 2000 years. Eye colour: Grey with a touch of blue, appears to be ‘silverblue’ at times. Appearance: As most elves quite fair, but not more so than others of her race. Face oval and a bit narrow, with a softly pointed chin. Narrow nose, a full mouth, large, almond-shaped eyes under delicately curved eyebrows. Symmetrical features, at the same time soft and defined; over-all bodily structure well put together, legs are perhaps a bit too long for her upper body. Slender hands with long, sensitive fingers. Her hair reaches roughly to her shoulderblades, is wavy and most often kept away from the face with several braids. Marital status: Single all the way. Once she thought that she had found the one, but now she strongly doubts that she will ever love again. Occupation: Scribe and part time borderscout and messenger to Lord Elrond of Imladris. Outfit: Most often she is seen wearing: a coat of dark navy-blue leather (with silver buttons in the shape of feathers, one has to remember ones roots), a large green cloak, grey tunic and leggings and high boots of darkbrown leather. She does have a chainmail-shirt, a light and strong piece of elven craftsmanship, as well as a pair of equally beautiful and functional bracers, but she only wears them when there is need. Practical clothing of elven make, beautiful and often in muted colours is her melody. Nothing is ever flamboyant or impractical, not to mention in the way, but she has on the other hand never been known to say no to a gorgeous dress now and then, if the moment is right. Only jewellery is a silver necklace set with pearls, a begetting-day gift from her parents, and a thin silver ring depicting leaves and feathers, given to her by the ellon she once loved. Means of travel: Can travel swift and lightly on her own two feet, but main means of transportation is still her irritable and fiery black, battle-trained elven-mare, Morthil “dark moon” (born during a lunar eclipse), commonly called Olvorn, “nightmare”, around the stables of Imladris. Personality: Somewhat reserved when meeting new people, but quickly becomes a merry gal with an acute sense of humour in the right company. Intelligent and can be quite patient when needs be. Once you get on her bad side though, you better watch out, ‘cause this elf is not one to be trifled with, especially if you harm those she calls friends. She willingly helps others with their problems, but does not share her own with many. She may reveal some of them, with time, but only to trusted friends. Not all of her memories are happy, and they serve to give her a more solemn and reserved edge. Skills include: Most battleoriented skills: Archery, swordsmanship, knifefighting. Other skills include: anything connected to a scribes work, speaks several languages (both elven and mannish) and dialects, but can also manage a song or two when in the mood. Can survive well on her own in the wilds, and with her inborn fine senses and soundless step, she is an excellent tracker. Not really much of a healer other than the basics, but when it comes to massaging stiff and aching muscles, she is a god! She has hardly any magical abilities, as they are counted, but her long years of scouting has given her a slightly sixth sense for evil and danger, but it is not always so that she realises what it is that she feels, only a sense that something is wrong. She has a strong will and mind something that has served her well several times in her life. Weapons of choice: An ash longbow, a gift of a Mirkwood friend; an elven blade inherited from her father, or twin elven knives. If the place allows it, fiery Olvorn may join in for a few nasty kicks, and peregrine falcon Menelor (“heaven-heart”) more than gladly swoops in to cause general disarray with shrieks and scratching claws conveniently at eye-level. Past bio: Born to a Noldo, Rîon, and a member of Círdan’s Falathrim, Mídhaer, some time during the first millennium of the Third Age of the Sun. She left Forlond partly because she wanted to see more, but largely due to the fact that the ellon she had loved lived there, and when he professed that he did not love her anymore, she felt that she couldn’t stay. Settled down in Imladris, where she lived in relative peace as a part of the Lord’s household. Adventurous in spirit she often set out on short trips to see the world, at times getting into battles of various size, but never getting hurt very badly. The rise of the Shadow darkened her lively spirit somewhat, and she centred more on protecting her home than venturing far and wide. She took no part in the War, other than guarding her home, but when peace returned, she was quick to go beyond the borders once more. Last edited by Andalion on Sun May 04, 2008 2:39 pm, edited 4 times in total. I'm new to online RP's but I've been in 13thC enactment so here's hoping it helps. Story: Some Goblins attacked some Families moving away from Eriador and cutting south around the misty mountains on their way to Gondor. The elves of Lorien went to their aid. A group of 7 humans were rescued; 2 men 3 women and 2 children. The men and women were badly injured from protecting the said children and despite the medicine of the elves died shortly after. The young children (twins) were raised in northern Lorien. One was named Faenoldo and the other Faroth since their actual names were unknown. The name Eglion (son of praise) was added simply because it was near miraculous that they survived. Faroth died the victim a giant spider attack, around the age of ten when he was out trekking through Mirkwood with their adoptive brother Gilgolodh. Faenoldo was more the type to study than to adventure, but the death of his brother made him want to learn the more war-like ways and he became an accomplished swords man. He is a horrible archer when you consider the fact that the elves of Lorien were his instructors. This is probably due to the fact that he had been injured very near his left eye the day he was found. Since the age of roughly twenty he has roamed the areas south of Lorien. Name: Geli. The Magnificent. Except on Tuesdays - on Tuesdays she's the Incredible. Appearance: Medium height, and slender, athletic build. With wide shoulders and narrow hips, she looks like the gymnast she is. Huge grin. Olive skin, large black eyes and long, wavy black hair - in a few years she might become pretty. Attributes and abilities: A street performer: acrobat, dancer, tightrope walker, juggler, singer, and a general-purpose daredevil. Has no concept of fear. Has some skills in street-wise self-defense with knife, stick and such, but her primary weapons are two fast legs. She is very hard to catch. Personality: Geli is usually on the sunny side. She can be reckless, but mostly she is an entertainer, and will try to cheer everybody up even if she herself is falling to pieces. Bio: Orphaned at the age of two, Geli was left in care of an elderly couple she called grandparents. As far as she knew, her father was a sailor, lost at sea; her mother had died of fever. When she was four, a traveling circus came in town. Seeing the little girl dance along with the performance, their master bought her, quite cheaply, from her guardians. Geli loved the wandering life, the freedom, the risks and the applause. Her most spectacular talent is at mimicking manner and voice until a patron thought he was looking in a mirror. Things began to change when she reached her 16th birthday. The boys she grew up with now wanted to sneak off without her for a taste of a man's freedom. The patrons seemed to expect the sort of entertainment she was not willing to provide. A day came when her master, the one father she has ever known, walked into the tent when Geli was changing and "made a move" on her. Furious, Geli left the caravan and struck off on her own, making a precarious living from her performing skills. Note: This is an all-purpose bio. Geli isn't tied to one time and place. Details may change to suit whatever story I'm playing her in. I'm posting a collection of characters I've made up for various role-play stories here. Appearance: Long thick dark hair peppered with silver-grey, slightly curled, and roughly hewn about the shoulders. short grey beard blending in with the grey temples. A few small scars could be seen on his bare arms. A large, very prominent scar cut down across the left cheekbone. He is considered tall even by the standards of the northern Dunedain, and quite muscular. His usual attire was his sturdy, yet supple and well-worn dark rust-brown leathers consisting of boots, breeches, and a thick leather sleeveless vest. Over it all he would wear a well-worn dark grey-green hooded cloak that had some few small tatters, unadorned except with a silver rayed brooch on the left shoulder. He was a Ranger, shadowed on his movements and deeds and keeping watch in the northlands of Eriador. Bio: Born and raised in a remote homestead in the rugged North Downs, he didn't remember his mother for she died giving birth to him. His father was away much of the time for he was a Ranger then. Malassuil was keen to learn, and he wou;ld watch and learn from the tradesmen that would come at times. He would listen and absorb from others all he could, especially from his father and the other rangers who would stay at the house at times. 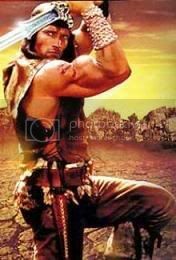 He became skilled with knife and bow, and even more so with a sword. He tended to his training and would become in time, as most young men of the Dunedain did, a Ranger. Through the years he had befriended some of the other rangers, but to others, he seemed distant. But he was keen to teach the younger rangers assigned to his company what he could, just as he was taught by those before him. Appearance: Dark hair, slightly curled, roughly hewn about the shoulders. slight facial hair, thickening at the chin that is also roughly hewn. A few small scars could be seen on his forehead and cheek, with a larger, prominent scar cutting inward and down across the right side of his forehead, cleaving his eyebrow, and re-appearing down on his lower eyelid and out across his right cheekbone. This war wound caused the right of his sea-grey eyes to squint a bit compared to his left. He is tall, but average by the standards of the northern Dunedain. He walked with an ever-so-slight limp from his right leg. His usual attire was his sturdy, yet supple and well-worn dark rust-brown leathers consisting of boots, breeches, a sleeveless vest and a full-sleeved coat cut and fitted allowing for free arm movement. Over it all he would wear a well-worn dark grey-green hooded cloak that had some few small tatters, unadorned except with a silver rayed brooch on the left shoulder. Bio: Born and raised in a remote homestead north of Bree, he was primarily raised by his mother as his father Malassuil was away much of the time for he was a Ranger. Malvagil was the eldest of two children, having a younger sister born a few years after he. Keen to learn, he would listen and absorb from others all he could. As he grew, he was sent to study lore under the elves in Rivendell. There he became skilled with knife and bow, and somewhat less so with a sword. He tended to his training and would become, as most young men of the Dunedain did, a Ranger. Being accepted to ride in the year 3010, it was a darkening time in the lands. At first his main assignments were to watch the road east and south of Bree, and he learned more-so the ways of the wild. He learned combat and had his first kills when riding in the north as the orc and warg raids from the Ettenmoors became more numerous. His biggest test came at Sarn Ford where he tried to stand before the Nazgul with his comrades. His horse broke and fled, but he regained control of her to return to the ford where some few of the hardier veterans still opposed them. But darkness began to close and they were too weak to prevent the Nazgul from entering the Shire. They then withdrew and made for Bree where they hoped to hold counsel with their chieftain. They watched and intimidated and confused when they could the Nazgul in hopes of keeping them away from their chieftain and his quest to Rivendell and beyond. It wasn't until later that year when Halbarad called them in haste to ride with him south to aid their chieftain. Malvagil was one of thirty that answered the call right away and left with little word. To war they went, and Malvagil fought well in taking the ships. In the fields of Pelennor the fighting was hard. He was wounded by a blade across the face, a spear in the thigh, and remembered little after he was struck in the head. Not far away, Halbarad lay mortally wounded. He was found after the battle, and was tended to and was deemed well enough to ride forth to the Black Gate of Mordor. There in the battle he was again wounded in the side, but lived and was healed. After the war and their chieftain married and was made king of Arnor and Gondor, he applied for and was formally discharged of his duty, and he returned to the north. There he lingered in the inns without aim, taking odd jobs now and then, but mostly lamenting his decision to return home. He had had enough of war and killing, but a warrior was what he was. There was word that there was still work to do subduing lands to the east and south of Gondor, and he debated with himself to return there and offer his services. At least that was what he was called, and he was content with that. His true name was forgotten, and it was said that he had forgotten it himself. The few who knew his real name didn't really want to mention it, or even acknolwedge that he existed. As for the name he was called by, there was a story behind it. Boartooth was a Beorning, a descendant of the legendary Beorn and a son of Grimbeorn the Old. As most Beornings, he was a skin-changer. He was able to change from a man into a large black bear, and woe to any foe that met him as such. It was at his first transformation that he gained his nickname. For when he changed back from bear to man, the transformation was incomplete. A fang from his lower jaw remained, and stuck. So, he was called Boartooth from then on. Maybe it was fated that he should be different from his kin, a rascal. He was not content to remain in the land of the Beornings, but was possessed of a wanderlust which caused him to travel far and wide. And that gave him the idea that he would be a mercenary, to sell his services to those who could afford them. In that, he was like the other Beornings, whose tolls were high to those who would pass safely through their land. But, his family frowned on him being a mercenary. Finally, after many disputes, his father relented. Very well, go on your forays. But NEVER to orcs or servants of the Enemy. Do not sell your services to them." Boartooth agreed to that. Although there were often many who were not too wholesome, who did not serve Sauron or his servants. Dwarves and men who needed his services, who had their own motives. But, whoever hired him found out he was a trusty employee, as he was closed to any who would outbid them until his task was done. That made Boartooth much in demand. As for his subtitle The Mace, that was also an accident. In one of his battles against a group of wargs and orcs, he ripped a heavy limb of a hornbeam, and after knocking it to a reasonable size, (for him) he used it as a club to fight against and slay his foes. It was a fitting weapon for it, and he never parted from it again. Over the years, he shaped it into a hardy weapon, a mace, which would last throughout his life. The handle had a tight binding of whipcord, which formed a loop to go over his hand, and the rest of the club had been fire-hardened, oiled and polished. Several arrowheads and spear-tips were half-buried in the wide, rounded head of the mace. Only Boartooth had the skill and strength to wield such a formidable weapon. As with his Beorning kin, he had a way with beasts and birds. He befriended a horse that could bear him, a strong black horse, almost Friesian in breed. He could call a falcon in need to go up and do reconnaisance for him. As for his appearance, he was a tall, well-built man with long black hair and a dark beard. He was somewhat of a pug-ugly, with the fang protruding from his lower jaw. His appearance when he transformed was that of a large black bear. His services were well in demand, and his price was high. He had many caches across the land which held his earnings. And now, his travels took him to Rivendell, where there was a chance to gather news, and being between jobs, he was where he would be certain to be hired. Appearance: Amber's a little shorter than the average hobbit, but nothing to comment on. She has long red hair that reaches the small of her back, it's usually tied out of her way when she is working. She has large, blue/teal eyes and faint freckles across her nose. Like all hobbits, she's quite round. She has quite nice curves for someone her age but doesn't over expose herself in the clothes she wears. Her clothes a quite plain, and usually earthy colours. She thinks it makes it easier when she gets muddy doing the gardening. Occupation: Errand girl for the village. Outfit: A short sleeved blouse in a sort of light mossy colour, a dark brown basque and a loose brown skirt that reaches her calves. Personality: In her younger years, Amber had a reputation of being a little cheeky. But at the age of 17, her dad had a fall and injured his leg, since then, she's taken over most of his jobs. She tends to gardens, helps bring in crops and lends a hand when it's particularly busy at the Green Dragon. Weapons of Choice: Amber's never really had to defend herself in battle, but she'd be able to hold her own in a fist fight. Past Bio: Throughout her childhood, Amber was a menace. She was one of the naugty children who were told off by farmers for scaring their livestock. But one day her father had a fall whilst painting a farmhouse and he hasn't been able to work on it since. Her father was more upset by the fact that he knew he wouldn't be able to keep Amber out of trouble. Amber could see that she was upsetting him and promised to act her age a bit more. Since then she's taken over all his previous jobs and more, helping out people where-ever she can. It's her way of saying sorry for all the trouble she's caused people in the past. Weight: 12 st. about 170 lbs. a steady tenor voice, almost baritone at times. Saruman. It is his aquiline nose that betrays his line of descent from Saruman. his old friend, Willum of Michel Delving. Personality: He is very pensive, but quick to laugh; fond of poetry, but poor at regaling a tale...he wanders. with Leonir and Leonir's minions. mysterious bride. It helps Parm to focus his musical energies and create the staff/sword fusion that he discovered on his quest to save Hobbituk's bride. be blessed by the slowness of time, the child would reach maturity naturally, but at 25 would age one year for every 50, yet look as if he were 80. Thus Parm only 36 Middle Earth years, Parm shas lived for over 550 years, and it looks like each year has been etched into him. Last edited by prmiller on Mon Sep 12, 2016 11:41 pm, edited 1 time in total. Weight:*sniffs* I'm not even going to dignify that with a response. Marital Status:Not married, but I'm wildly in love with my girlfriend,Sythle. Yeah, I'm gay. Get over it! Personality: sarcastic, snappy, and irritable, but I have a very kind heart. Past /Bio:I'd rather not talk about it. Ridmahille-A surrogate mother, she got me through the pain of my past. Personality:I'm sweet, kind, and thoughtful... but in battle, I'm vicious! Weapons:i'm proficient with a sword, but my greatest weapon is my voice.I've learned the Captivating Voice. If i sing, I have the power to hypnotize my enemies. Bio:I'm the real daughter of Ridmahille. My father died during the war. I'm newer here so if I am doing something wrong please tell me. Anyway here is my character. Borodin grew up in the gondorian city of Pelargir. His childhood was filled with happy memories of Mariners and ships. He was a tall, slender, almost gangly man. He had shorter black hair that fit well into his winged helmet. At a young age his father instilled him with a love of honour and honesty. When he came of the age his father presented him with his families most cherished possession. A horn with the shape of a eagle. This represented his family's dedication to honour, valour, and reliance. He was to protect this horn at all costs as without honour what is a man? He was accepted into the gondorian military at a young age. He rose through the ranks quickly because of his leadership and tactics skills especially when on the defense. He always had a love of swords. He felt they were an honorable weapon. Bows and arrows could pick men off at long range wich to him always felt slightly cowardly. "If you truly call yourself a warrior then you would not mind a hand to hand duel" we would tell an occasional archer. Borodin instead of decieving his opponents would force himself to get better or band together to fight an enemy he would have trouble defeating. Borodin eventualy was promoted to captain. He lead patrols around Pelargir. His father was a guard of the citadel. Before WR Borodin was leading his patrol when his patrol was ambushed by a company of orcs. Outnumbered him and his party got into a phalanx and decided to go out with a bang. Borodin remembered his honour in what he presumed would be his final hours. He was however deep in his heart he was upset he had never had the opportunity to have a son to keep his family name and bloodline alive. He never really was attracted to women. His call of duty always was in his way. But that didn't matter now. He was going to fight as hard as he could. He didn't have time to send out a messenger but the city needed to know that this band of orcs was coming. He had all of these thoughts almost simultaneously as he began yelling orders to his men. He had trained his men to be ready to give thier lives for the protection of Gondor but now that the moment came when he would presumably die he just wished he could live to protect Gondor one more day. The orcs were nearing the company but before they reached him he blew his fathers horn to signal for help. When the orcs finaly befell his company he fought with everything he had. One Orc caught his eye. It stood taller and faster than the others. This Orc was presumably a leader. He had a scarred face with red battle paint. His eyes radiated with evil. Many a man stared into those dark eyes but few had survived the ordeal. Borodin stood up to face this orc captain. This duel was intense. Both combatants were skilled swordsman. Shields bashed and swords swung but birthed fighter refused to fall. Until Borodin felt a sharp sudden pain in his calf. Screaming in pain he fell backwards off the rock he had been fighting on and landed in a patch of taller grass. He blacked out from pain. When he awoke he was on a wooden table in a house. "We're am I?" He said to no one. A male voice spoke out and said that he was in the home of Brand the farmer. Brand explained that he had heard a horn when he was farming. By the time he had arrived at the battle it was almost over. He saw orcs carrying off a few of his men but he had seen Borodin fall into the bushes. After the orcs had left he found Borodin and he brought him back to his home for medical aid. He suffered no major injuries aside from the arrow in his leg and that would be fairly easy to repair. Borodin didn't know what to do. His men and closest friends had all been killed or captured and probably tortured. As far as he knew he was the only survivor. Why did he have to live when he couldn't save his friends? Guilt flooded over him like a tsunami. But this guilt soon mixed with a newer emotion. Revenge. He had never really felt revenge before. His enemies had never struck so close to home to rip his noble heart in two. He would not rest until he had found this orcish filth that had no love of goodness, honour, or love. He made a promise to himself that he would find this orc and avenge his kin. But there was not much he could do now. He still had trouble walking let alone being able to be helpful to Gondor. He would need patience but he knew one day he would meet his nemesis again. And there would be no end to his wrath when that happened. Until then he waits.